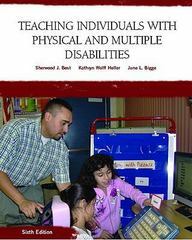 Teaching Individuals with Physical or Multiple Disabilities 6 Edition Comprehensive and unique, this text provides special educators and others education professionals with the knowledge and strategies for creating meaningful educational experiences for students with physical, health, or multiple disabilities. It is the only text published that specifically addresses the educational and psychosocial needs of students with physical or health impairments who do not necessarily have cognitive disabilities and explains the psychosocial impact of disability including those disabilities that are degenerative and terminal in nature. It teaches key knowledge and strategies for creating meaningful educational experiences for students with physical, health, or multiple disabilities and illustrates how assessment and curriculum accommodations and modifications support students with physical or multiple disabilities to reach their highest potential. New to this Edition! NEW! Features a completely redesigned model for planning and designing courses of study for students with disabilities that is aligned with core academic curriculum - found in the chapter on curricular options (Ch. 5) and modeled throughout the text. Familiarizes readers with the theory on which text coverage is based and gives them a structure on which to “hang” current and future knowledge. NEW! Includes the most updated information on federal legislation - Summarizes the key aspects of NCLB and IDEA (Ch. 1) Describes mandated assessment and appropriate accommodations and modifications. NEW! Redesigned transition content (Ch. 12) - emphasizes self-determination as a guiding factor developing student outcomes. NEW! Photos and illustrations throughout the text - Created specifically for this text, with enhanced chapter opening photos. Enhance the narrative throughout and the uniqueness of the text overall. NEW! For faculty an Instructor’s Manual is now available - to help structure their course and make the content more meaningful to their students.